Donald Trump’s stunning upset victory has occasioned a lot of searching among political analysts for an underlying explanation for the unexpected turn in voter sentiment. Many point to Trump’s galvanizing support among white working class and middle income Americans in economically depressed regions of the US- particularly Appalachia and the upper middle west “Rust Belt” – as the main factor that put him in office. While the Democrats concentrated on the so-called “coalition of the ascendant”- voter groups like Hispanics and Millennials that are growing, Trump rode to victory on a “coalition of the forgotten”- working class Americans in economically depressed regions of the U.S. who had been left behind by the economic expansion of the past seven years. 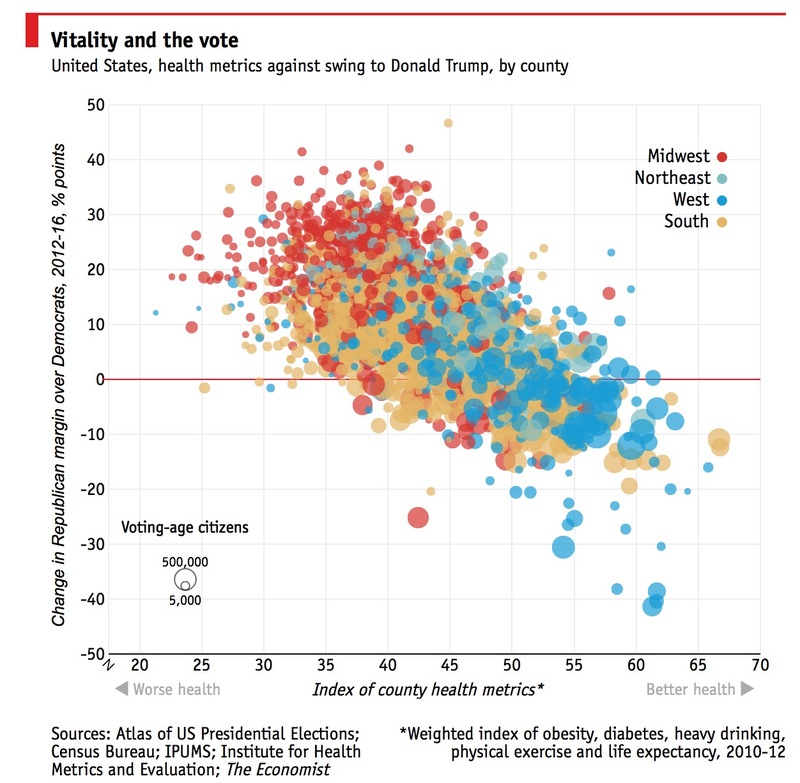 When the Economist searched for a more powerful predictor of the Trump victory than white non-college status, they found a surprise winner: a composite measure of poor health (comprised of diabetes prevalence, heavy alcohol consumption, lack of physical activity, obesity and life expectancy). Believe it or not. this measure of health status predicted a remarkable 43% of the improvement of Trump’s vote percentage compared with the 2012 Republican candidate Mitt Romney, compared to 41% for white/non-college. National Health Expenditures Continue to Accelerate in 2015. What Does That Mean? In 2009 a youthful Barack Obama addressed a joint session of congress on health care on a cold fall evening. The country was still recovering from the great financial crisis, and the new President was now attempting to turn the nation’s eye to health care. As he had done many times before, Obama spoke powerfully of the tragedy of millions of citizens with ‘no access’ to health care, but spoke practically of the unsustainable and untenable economics of health care. “The essence of strategy is choosing what not to do.” Michael Porter. It is so often the case that organizations try to do things they should not do. Call it irrational exuberance; getting out in front of the curve; or a bridge too far. Hospital systems are examples of that. Already large, complex organizations doing incredibly challenging things with billions of dollars flowing through their systemic blood vessels, they are understandably tempted to do more. They always are. That is the inevitable urge of active hospital board members and ambitious executives. Do more; not do less. After all, who arrives to such an exalted position to do less? Their collective corporate eye is cast toward health insurers who have been called bloated and inefficient; dinosaurs; dim witted at best. The President of the United States, no less, disparaged insurers while promoting the ACA, labelling them the “villains” of the healthcare system. Speaker Pelosi called them “immoral.” How difficult can it be to do health insurance better than the insurers have done it? Should be easy for people as smart as those who run complex healthcare delivery systems. U.S. life expectancy declined in 2015 for the first time in more than two decades, according to a National Center for Health Statistics study released last week. The decline of 0.1 percent was ever so slight ― life expectancy at birth was 78.8 years in 2015, compared with 78.9 years in 2014. However, this reversal of a long-time upward trend makes these results significant. While many researchers are scratching their dumbfounded heads in utter astonishment, I hypothesize the decline in life expectancy is partly due to the decrease in the primary care physician supply. Studies have shown the ratio of primary care physicians per 10,000 people inversely correlates with overall mortality rate. It is a well-known and reproducible statistical relationship that holds true throughout the world. In the U.S., increasing by one primary care physician per 10,000 population, decreases mortality by 5.3%, ultimately avoiding 127,617 deaths per year. Headlines last week highlighted how much these unexpected results left the researchers baffled. Jiaquan Xu, a lead author of the study told The Washington Post, “This is unusual, and we don’t know what happened…so many leading causes of death increased.” Age-adjusted death rates went up by 1.2 percent, from 724.6 deaths per 100,000 people in 2014 to 733.1 in 2015. Death rates increased for eight of the ten leading causes of death, including heart disease, chronic respiratory illness, unintentional injuries, stroke, Alzheimer’s disease, diabetes, renal disease and suicide. Differences in mortality were most prevalent in poorer communities, where smoking, obesity, unhealthy diets, and lack of exercise are ubiquitous. If confirmed as Secretary of HHS, Tom Price will oversee a $1 trillion budget – roughly one-third of all health expenditures. His proposed legislation “Empowering Patients First” seeks to control costs by giving patients more choices and providing the information required to make them. He calls for publicly available standardized information on the price and quality of physicians, hospitals and other health care institutions. It sounds like Dr. Price is prescribing a single data system. Medicare has had a single data system on the over-65 population for decades. Since 2005, these data have informed Hospital Compare, a consumer oriented website comparing the quality of over 4000 hospitals. And while prices in Medicare are relatively fixed, these same data have shown substantial variation in costs because the quantity of service – the number of hospital admissions, procedures and physician visits – varies substantially from place to place. But Medicare is only one piece of the data puzzle. A National Bureau of Economic Research report[nber.org] added another piece last year with data from large insurance companies like Aetna and United. For the under-65 commercially insured population, it’s not just the quantity of services that are all over the map – it’s also the prices. In large part due to the $35 billion, Health Information Technology for Economic and Clinical Health (HITECH) Act incentives more than 80% of acute care hospitals now use EHRs, from under 10% just 7 years ago. Despite considerable progress, we have not achieved all that was originally envisioned from this transformation and there have been numerous unexpected adverse consequences (UACs), i.e. 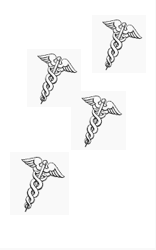 unpredictable, emergent problems associated with health IT implementation, use and maintenance. In 2006, we described a set of UACs associated with use of computer-based provider order entry (CPOE) (see Table 1). Many of these originally identified UACs have not been completely addressed or alleviated, and some have evolved over time (e.g., more/new work, overdependence on technology, and workflow issues). Additionally, new UACs not just related to CPOE but to all aspects of EHR use have emerged over the last decade. We describe six new categories of UACs in this blog and then conclude with three concrete policy recommendations to achieve the promised, transformative effects of health IT. Adoption of EHRs was supposed to stimulate a tremendous increase in availability of patients’ clinical data, anytime, anywhere. This ubiquitous increase in data availability depended heavily on the assumption that once clinical data were routinely maintained in a computable format, they could seamlessly be transmitted, integrated, and displayed between health care systems’ EHRs, regardless of differences in the developer of the EHR. However, complete clinical information on all patients is not yet available everywhere it is needed. The brand new President Barack Obama, whether wittingly or not, invested his entire political capital in reforming health care in America. He gambled and he lost, not because he had nefarious intentions, but because he left the gory details to a corrupt Congress and a shady cadre of lying and conniving technocrats, ending up with something vastly different from what he campaigned on. From everything I’m reading now, Mr. Trump is about to walk in Mr. Obama’s footsteps, and if he does, the results will be unsurprisingly identical. Recently, President-Elect Trump selected Rep. Tom Price, MD to lead the Department of Health and Human Services. Suffice it to say, this signals Mr. Trumps’ resolve and commitment to definitively repealing and replacing. Dr. Price has already sunk his teeth into health care reform, having proposed alternative healthcare solutions in every Congressional session since 2009. As a physician myself, I am delighted at the prospect of having another doctor at the helm of HHS. The last physician to lead HHS was Louis Sullivan, MD as part of the administration of George H.W. Bush. Having a physician, who can understand the needs of physicians and patients, representing both in health policy decision making at the federal level gives everyone the best chance for meaningful and successful health care reform. Mike Milligan, a Harvard medical student, recently wrote in THCB about the shock felt throughout his medical school upon the election of Donald Trump. Seeking to understand how it may be that ‘equality, service and compassion’ were defeated, Mike settles on the narrative that appears to have taken hold of the elites on the left – Trump did not really win, Hilary lost. While he does not say so in explicit terms, clearly we are to understand that the recent election was lost, and that in order to assure a better outcome the next election, physicians should urge their patients, and particularly their ‘poorer and less educated patients’ to register to vote. Hopefully, these voters can then ensure that access to ‘affordable, high-quality medical care’ through constructs like Obamacare and MACRA are nevermore placed in jeopardy. Let me start with the factually incorrect parts. The Healthcare Dollar, the Healthcare Industry and the Healthcare System are shibboleths. All are parlance. All render terms such as Healthcare Profession, Service Profession, and Healthcare Professionals quaint. All drive linguistic determinism: if it’s labeled so, it must be so. Furthermore, all have become jingoistic. This is our dollar, our industry, our system and don’t dare tread on us.